In rotary folding machines a precise movement of the paper during the work process is necessary to avoid that the paper gets torn. The challenge is the exact positioning of the secondary axes in a way that they can precisely and continuously execute the predefined machining pattern, even at high speed. A rotary folding machine with variable pleat heights consists of a main axis for paper transportation and secondary axes for the processeing of the paper roll. The axes are started synchronously and the different pleat types and pleat heights are controlled by the secondary axes in relation to the main axis. 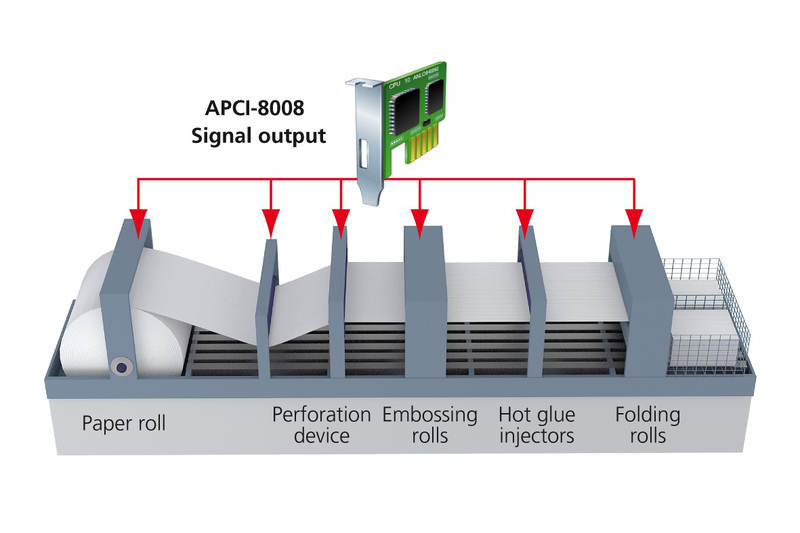 To ensure a precise positioning of the secondary axes, the intelligent motion control board APCI-8008 is used. The reason for this is the ELCAM funcitonality of this board which allows the tracking of the single axes in relation to the main axis through a table function. For this, a table of interpolation points is created. Intermediate values are calculated with linear interpolation. For emergency situations and machine security, another table of interpolation points can be created for a safe shutdown of the machine. This is also guaranteed in case of a PC crash as the APCI-8008 has its own processor and RAM memory. So the application can run directly on the board.